The Oakland Fox Theater show from DJ Shadow & Cut Chemist’s Renegades of Rhythm tour which used vinyl borrowed from Afrika Bambaataa’s historic record collection. Available on Shadow’s site exclusively on VHS. DJ Shadow + Cut Chemist are currently on the Renegades of Rhythm Tour using records from Afrika Bambaataa’s record collection. Cut Chemist put together this mix as a small slice of what they’re playing. Essential. 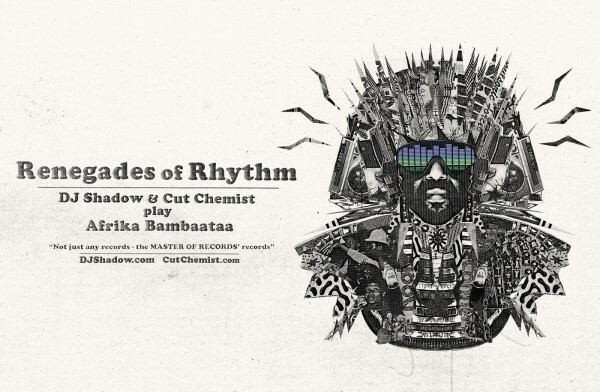 It’s sure to be fairly epic…Cut Chemist & DJ Shadow will embark on the ‘Renegades of Rhythm Tour’ this fall celebrating the legacy of Hip-Hop pioneer Afrika Bambaataa. They are pulling records from Bambaataa’s collection ( 40,000 strong!) to put together a mix of Soul and Rap, Soca, Calypso, Dub, Salsa and more.